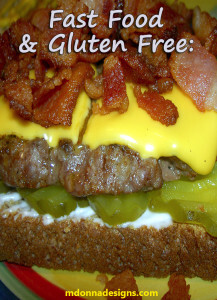 In the gluten-free world, eating at fast food restaurants can be a challenge. The drive-thru menu is no help: everything seems to be breaded and deep-fried, or it comes on a bun. What’s a wheat-free person to do? Luckily, restaurants are slowly coming around, and the choices are opening up. With a little creativity, you too can find menu options that fit into your lifestyle. Salads are often an option (but honestly, aren’t you becoming a little sick of eating salad every single day? ), but there are more creative choices that you can eat as well. And sometimes, a hot cup of chili is just what you need. I’ve compiled a list of my favorite wheat-free places to eat. Keep in mind that you always need to double check with the restaurant manager, and cross-contamination is always an issue. The only 100% safe food is food that you make yourself. 1. Wendy’s Chili with extra meat: Make this dish a meal by ordering a large Wendy’s chili and a Junior hamburger plain and with no bun. Chop up the burger and toss it in the chili. For an extra kick, take it home and add a sprinkle of cheddar cheese and a dollop of sour cream. 2. Wendy’s Potato: According to Wendy’s website, there are many baked potatoes that fit the gluten-free lifestyle. They have a list of potatoes and toppings including bacon and cheese, broccoli and cheese, cheese, chili & cheese, and sour cream & chives. Yum. For more information on Wendy’s Gluten-free menu items, visit their list of gluten-free entrees. 3. Burger King has very few wheat free options on their gluten free menu. You can adapt the menu to meet your wheat-free diet by orderinga burger without the bun; it may seem odd, but it’s pretty tasty. If you order enough fresh vegetables, like a lettuce, tomato and onion on top, it is actually quite delicious. It almost tastes like a real meal and you won’t miss the bread. Quick tip: Order a double so you have plenty of meat. 4. Subway is known for its sandwiches, of course. But order a delicious salad using their gluten free menu ingredient list, and you’ll be set with a yummy meal. 5. Stop at Chipolte for a delicious corn tortilla and you’ll feel like you’re eating in style. Add rice, beans and your choice of gluten free protein. Top it off with yummy traditional toppings like sour cream, guacamole and cheese, and you’re good to go. 6. Domino’s Pizza now offers its own gluten free pizza option. It does offer a disclaimer that says it can’t promise that there is no cross-contamination. It’s not as good as their “regular” pizza, but it will do in a pinch. My wheat allergy is low, and I do not have Celiac disease, so I can eat it. Use your personal judgment before indulging. 7. At Chick-Fil-A, try a Chargrilled chicken sandwich without the bun. This is an excellent choice when you are trying to avoid gluten. Although I don’t eat at this establishment, as we have severe peanut allergies and they fry many of their foods in peanut oil. So we generally stay away as a personal choice. 8. While I have not yet tried this, I am looking forward to tasting it. I’ve heard that Hardee’s (which is also known as Carl’s Jr. in some areas of the country), serves burgers on lettuce wraps instead of buns for its gluten free customers. If you’ve tried them, please let me know in the comments below. I’d love to hear about your suggestions for gluten free fast foods. Please add your comments and suggestions below. « What Foods are Gluten-Free?